In a poll of Jewish public, 53% say that the state is entitled to encourage Arabs to emigrate from Israel. Haredis most 'nationalistic' group. Was Rabbi Meir Kahane right? A poll by the Israeli Democracy Institute suggests most Israelis might agree with the late rabbi and political leader, who favored encouraging the emigration of Arabs from Israel. The annual Democracy Survey found that 53% of Jewish people in Israel maintain that the state is entitled to encourage Arabs to emigrate from Israel. Eighty six percent believe that critical decisions for the state should be taken by a Jewish majority. Jewish forces expelled Arab residents by force in Israel's War of Independence in 1948, while others fled of their own accord. That conflict began with a naked attempt by several Arab armies and Arabs living on the Land of Israel to slaughter all of Israel's Jews, just three years after the Holocaust. Since that time, the idea of expelling Israel's Arab population, either by force or through compensation and voluntary emigration, has gradually become taboo. The expulsion of Arabs is referred to by the World War Two term 'transfer' and regarded as unconscionable. However, the IDI poll appears to show most Israeli Jews see as legitimate unspecified steps for “encouraging” Arabs to leave. Trust in the Supreme Court is at an apparent all-time low: only slightly more than half the general Israeli public—54%—state that they trust the Supreme Court fully or to some extent, while 44% state openly that they do not trust it. Only 41% of the respondents have full or partial trust in the police. The IDI survey shows that the sector of the Israeli public with the most nationalistic views on Arabs living in Israel is arguably the hareidi-religious one. 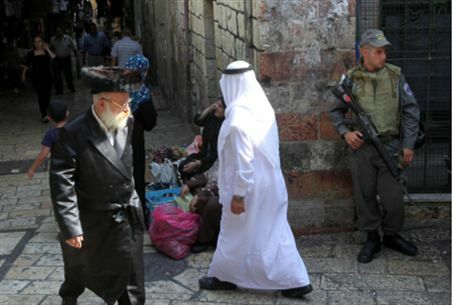 While just 33.5% of secular Jews are opposed to granting such Arabs equal rights, 51% of traditional Jews, 65% of religious Jews, and 72% of hareidis are oppose to the idea. Sixty-two percent of the Jewish sample feel that as long as Israel is in a state of conflict with the 'Palestinians,' the views of Arab citizens of Israel on foreign affairs and security issues "should not be taken into account." As for equality in the allocation of resources, 55% of respondents think that greater resources should be allocated to Jewish communities than to Arab ones. Among right-wingers, a clear majority (71%) agree with it.